Welcome to the first day of Summer and guess what? It’s time for a challenge. 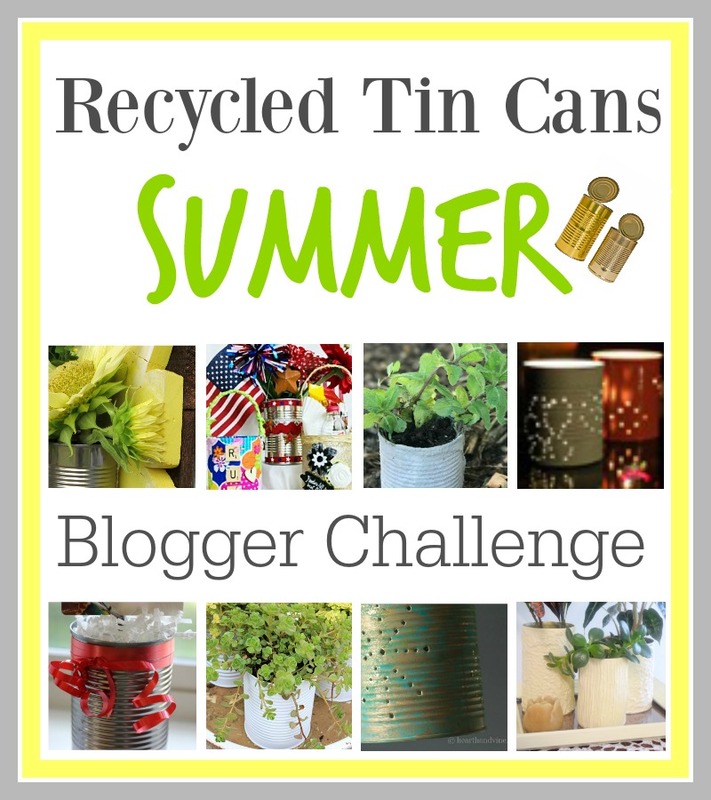 I’ve teamed up with some blog friends for tin can creativity, make sure to visit their clever ideas at the end of the post. Bonnie from Farmhouse 40 organized this celebration and little did she know I love metal elements. This is a fun one where creativity was definitely required because for weeks I had no idea what I was going to make. Then something awesome happened, a spark of inspiration surfaced as I watched some Jade sunflowers bloom, learn more here. It was pretty sweet to have something simple like a sunflower spark imagination. The following list outlines what I used to create this project. Keep in mind I used scrap wood, see if you can recycle first before purchasing new wood. This piece is pretty simple, there’s several steps and waiting for painted objects to dry is necessary. Materials can be purchased at any home improvement and craft store and I’m assuming many of these tools are handy in your own work space. Begin by cutting the backboards with a table saw first, this is a simple, three 13 inch cuts. If you want a taller background then add a fourth; the table saw helps to provide a nice straight cut but if all you have is a jig saw then make it work. After the cuts are completed sand each board so they’re nice and smooth making stain application less difficult. Now take a section of panel board and sketch the shape of a sunflower. I did this freehand and you’ll notice there was some afterthought during the process. Once the sketch is completed begin cutting the pattern with a Jig saw and finish by sanding out the flaws. Paint the front and edges of the sunflower with a bright yellow acrylic paint. If you plan to hang this outside make sure to purchase the appropriate finish for your project. I brushed this on the surface with one thick application and set it aside to dry. Since the background boards were sanded I applied the stain on the front and edges with a rag. The wood soaked up the stain in minutes so I made sure to work fast then left the boards to dry. At this point I went and did something else because moving on wasn’t possible until the wood was dry. Stenciling is optional and needs be done prior to connecting the sign. You may want to use a different message, Sunflowers make me smile so I decided on the word happy. I had some individual letters and transferred “Happy” using white chalk paint. Stencil tips can be found here. What word or words would you transfer on a sign like this? Once the stencil is dry everything needs to be lined up and flipped because we’re connecting from the backside. This means your sunflower needs to extend to all three boards. This is really simple and I would recommend drilling pilot holes first to keep the wood from splitting. When I finished connecting everything I noticed the yellow was really bright so I toned it down and some white highlights. These were light brush strokes that were easy to incorporate on the edge of the flower shape. I’ll address adding the copper wire in just a minute so keep the drill handy. With just two tin cans I drilled holes towards the top of each one and attached directly to the wood. Be careful and wear work gloves in case things slip. I wanted to incorporate another metal element so I used copper wire. Drill three holes, one in the top right corner and two holes on the left side. There was only three feet of copper so I started threading through the top right, then went into the second hole from the back side. I also incorporated some twisting before entering the third hole. This addition was for interest only and can be implemented however you choose, just have fun with it but make sure you have a plan before diving in because copper can get wacky pretty quickly if you over bend. Later I added a hanger on the backside and before I knew it this was ready to fill with fresh flowers. To finish the project, I filled the cans with water and used Jade Sunflowers and Lemon Balm from the garden. Other options would include any kind of fresh cut; silk or dried flowers. I was also thinking this could be handy in a shed filled with garden tools? But I guess the big question is this, “When you look at the finished piece does it represent smiles, sunshine, summer and a bit of happiness?” I hope so because that’s what I was after. Enjoy a Happy Summer Everyone and remember to check out additional Tin Can Projects in the links below.. This is adorable and perfect for your favorite sunflowers or any flowers for that matter. You are so good with wood. I could also see this project as a place to hold other things like pencils, pens or paint brushes. Love it! Me too, I’m thinking about using it in my future office, right now it’s in the garden and the first thing I see when I enter. If you would like some of those Jade seeds email me your address some of them went to seed super quick!! What a wonderful project, Carole! And I agree with Patti that it would also be fabulous to use as a place to organize craft supplies. Great job! I just love how you incorporated these darling and happy sunflowers into this tin can project! What a perfect gift too. Yes it would make a neat gift idea – you could even scale it down to one can. Oh, Carole, your sunny sunflower hanger does make me smile! It’s such a bright and cheery take on summer and I just love your creativity. The addition of copper is perfect and adds a unique flair of interest. Beautiful job! Smile bright and cheery is good.. I guess I’m welcoming summer with some serious happy. I don’t ever seem to get tired of working with copper and I just happen to have that in the workshop and it needed a home. Carole……this project certainly does make me think of summer, sunshine and smiles. Beautifully done. Love it. I’m so excited, Carole. Our new house has a workbench. Maybe I can learn to make some of the wonderful things you do. You are such an inspiration! Awesome news – a good workbench is wonderful..
You are inspiring me to want to use power tools! This is so pretty and looks like it wouldn’t be too difficult. Power tools are fun and opens the door to a new level of creativity. It really isn’t a difficult project just a lot of steps..
That’s so neat I would love to see your finished projects so make sure to send me an image when you get a chance. Glad this project was inspirational. I love this idea, and would like to try it, but I’m not good at free hand drawing. Could you share the pattern for the flower Please? Unfortunately there isn’t a pattern for the sunflower I just played around with it.. If you try I bet you would have no problem creating a design.. Keep it simple and remember you can sand away any mistakes left behind. Or better yet practice on scratch paper. You’ve got this! !